In 1967, Gray Melvin was an idealistic Carolina college student and Annie Lineberger was the most beautiful girl he’d ever met. He loved her on sight, driving to the small private college every weekend to see her, not knowing she was also dating someone else during the week. Gray took it hard when Annie broke up with him. They argued, she left his car, and was never seen again. Nevertheless, she stayed with him. Gray would never escape Annie Lineberger. When Annie is reported missing, the police home in on Gray. They never have any other suspect, never look for anyone else. At last they let him go because there’s no conclusive evidence, but Annie’s influential family hounds him from then on. Gray is expelled from his college. Every job he takes last only long enough for the Linebergers to speak to his boss. Now, it’s decades later, and Annie once more appears as a bunch of bones dug up to make way for a supermarket parking lot. Gray is immediately hauled in by the police. He’s manhandled by officials, beaten by “concerned citizens,” once again confronted and threatened by Annie’s family. ‘I didn’t do it,’ is all Gray can say. ‘We’ve been waiting a long time for this one,’ the district attorney says, smiling with just his mouth. There’s only so much a 68-year-old body can take, but no matter how battered, Gray refuses to admit to a crime he didn’t commit. The college where he’s taught for 20 years fires him. The press and TV ruin any chance of a fair trial. There are only a few people who believe in his innocence: his girlfriend, his lawyer, reporter friend Willie Black, and a woman he met shortly after Annie disappeared. Corrinne Manzi’s also a reporter, and she gives him as much positive publicity as the Linebergers are giving negative. Nothing seems to help, however, and his lawyer warns him he may be arrested soon. Then Gray gets a call from a stranger in Sykes, NC. She’s found a ring in a thrift shop, a class ring with his initials. Would he like to have it? The last time Gray saw that ring, it was in Annie’s hand as she walked away from him that fatal day. Gray’s certain if he can discover where his ring has been all these years, he’ll also find Annie’s killer. His lawyer counsels not to go, let someone else do the investigating, but Gray’s never taken his advice yet. Why should he start now? All he has to do is keep from being arrested, and if he can do that, he may find Annie’s real killer. 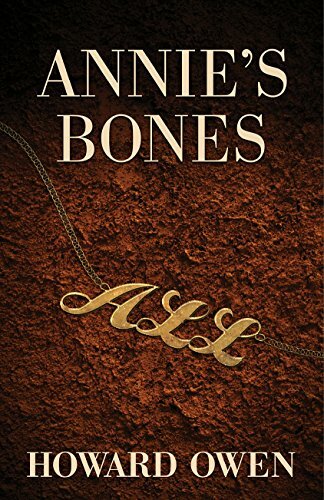 Told from Gray’s point of view with flashbacks to 1967 and the events leading up to Annie’s disappearance, Annie’s Bones is a novel revealing how money and influence are used to relentlessly pursue an innocent man, and that man’s struggle to get the justice he deserves when he’s already judged guilty by police and public. Author Owen’s creation Willie Black, titular protagonist in the series of the same name has a tertiary role in this novel, appearing as Gray’s friend who refers him to flamboyant lawyer, Marcus Green. There’s an interesting cast of characters, but Gray, with Annie, holds center stage throughout. Everyone else is secondary, sketchily described, and either for or against Gray Melvin.